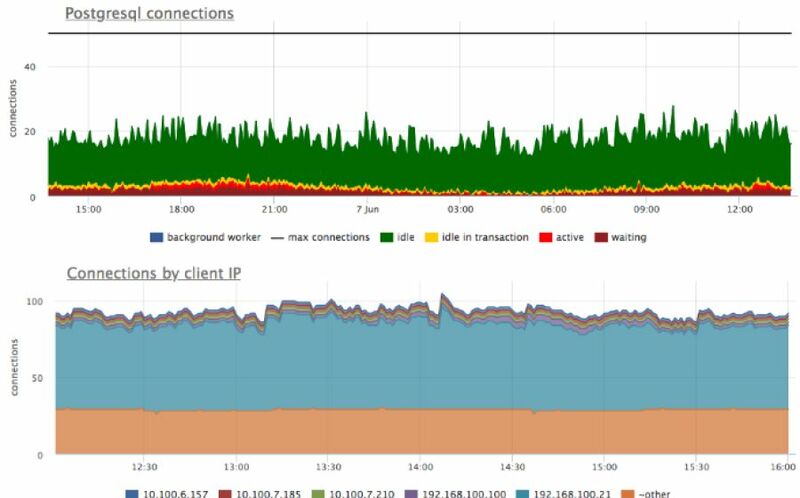 Monitoring agent knows and collects thousands of metrics on Postgres operation. It guarantees you will have everything need. Handy summaries and detailed views for every aspect of DB performance. You'll see through the eyes of professional DBAs. Okmeter knows all possible problems with Postgres ahead — common pitfalls, suboptimal settings. You'll be prepared for everything. 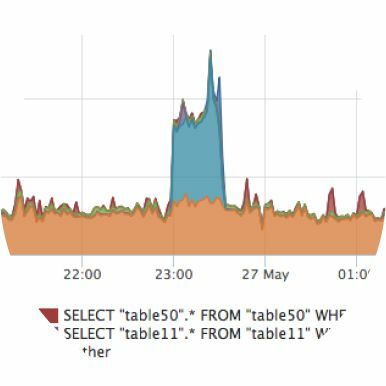 Workload monitoring is the cornerstone of database performance analysis. You'll know whenever some request generates CPU or disks overload. Okmeter will show you exactly which one caused it. You'll be aware which IPs created how many connections, and what states they are in. You'll have a distinct understanding of how many transactions are actively executing queries, how many are idling, and whether some are waiting on locks. These are two crucial storage processes in Postgres that write changed data to disks. Its configuration not only defines disk IO load, but query processing times as well. 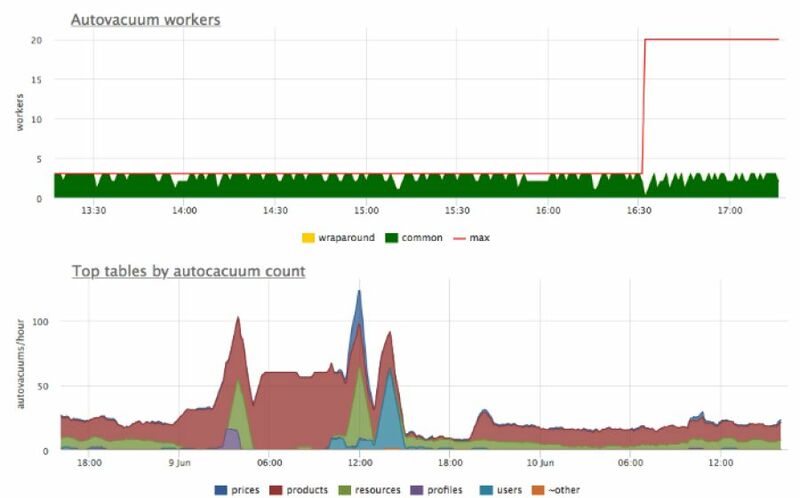 Autovacuum is a critical Postgres process, designed to clean up unneeded data. It also updates query planner statistics and prevent data loss due to transaction ID wraparound. Be aware of autovacuum operation and its proper setup. Postgresql streaming replications if widely used for fault tolerance and scaling, you wouldn't want it to be in a bad condition. Okmeter will keep an eye to ensure it's working well. 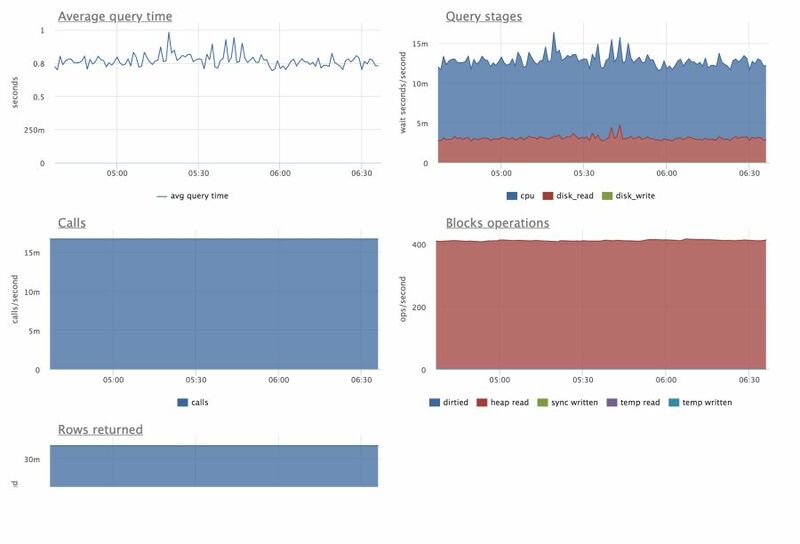 Internal Postgres operational metrics are not enough to get a full picture of what's happening on the server. Okmeter has all the system metrics and monitors every process on the server. You'll have preset dashboards and triggers on top of all that. 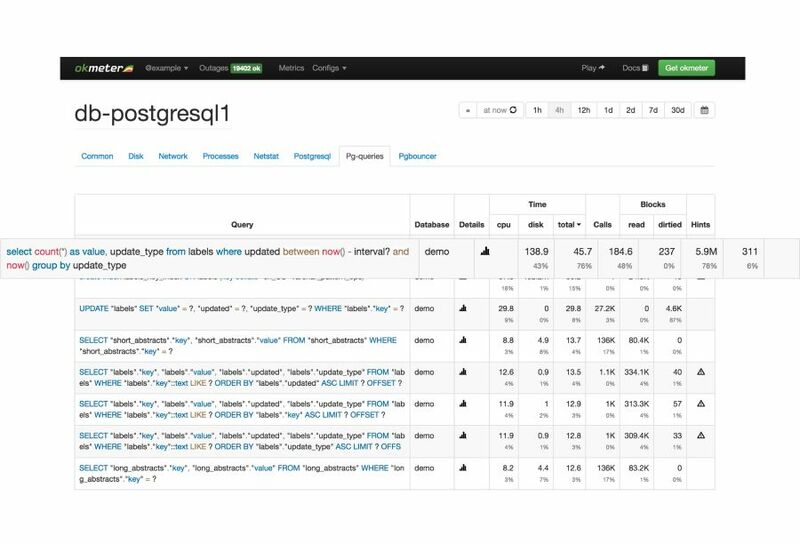 With metrics on every database request you won't have to guess what's happening within your Postgres. 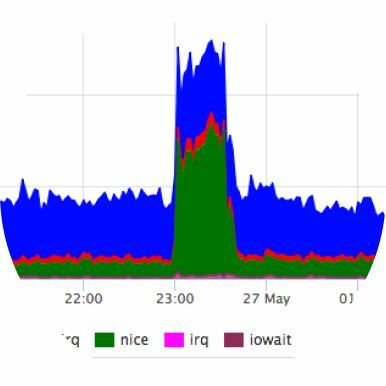 Know exactly which request caused an increase of database CPU usage or disk IO. Monitor response time of each request. See actual results of optimizations. With our metrics you'll know how to optimize any query ­— whether you need to add work_mem, tune bgwriter or increase shared buffers. 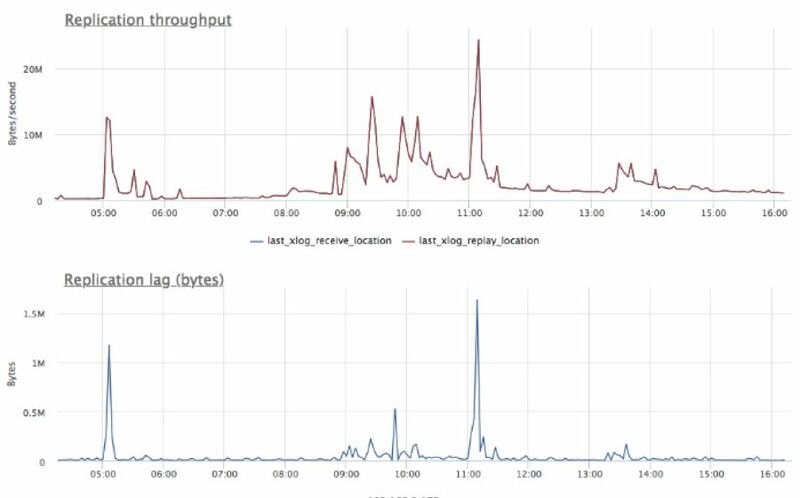 With detailed per query resource usage metrics, you'll see exactly what induced surge in CPU or disk IO usage, that lead to performance degradation. 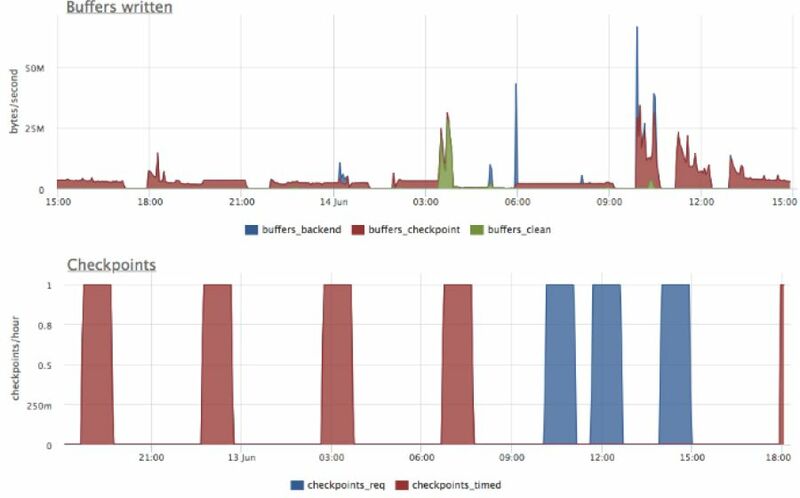 Clear picture of what is the root cause of bad performance — missing indexes, lock waits, memory limits, disk latency. With optimization tips and suggestions you'll know whether you need to increase work_mem, tune bgwriter, or increase shared buffers. 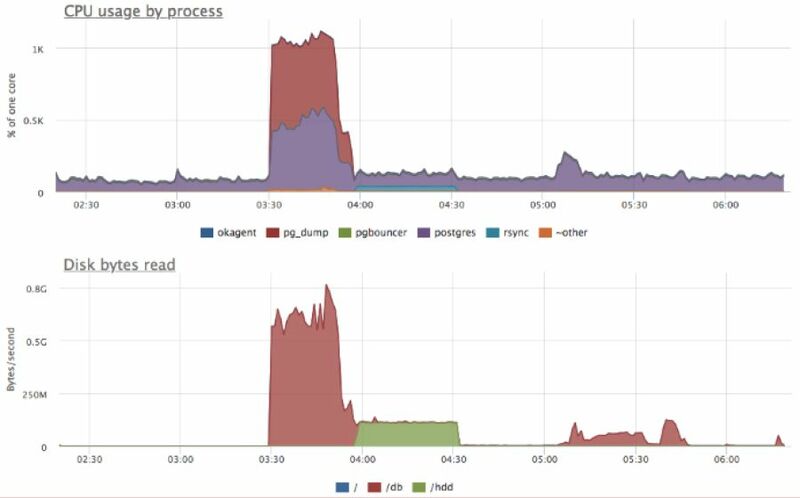 You will know exactly which request caused the increased CPU load or high IO usage. 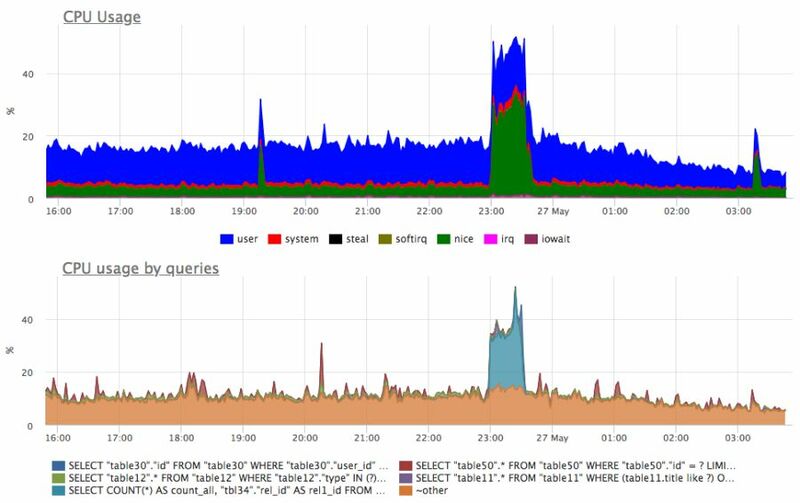 With these detailed metrics you'll know which queries to target for optimizing CPU usage, disk read or write load, and query execution time. Importance of this postgres background process is often underestimated. It not only recovers disk space and prevents table bloat. It also updates query planner statistics and visibility maps, to maintain high performance, and prevents transaction ID wraparound data loss. It is crucial to know that autovacuum functioning is optimal. Okmeter not only notifies you of problems with its operation, but ensures that you know of suboptimal settings and ways to make it work properly. More about that. Persisting data in postgresql occurs in several stages: first the data is changed in memory and written to WAL, and only later modified pages are synced to disk. Background writer and checkpointer settings may drastically improve postgresql write performance by smoothing disk IO load. While their suboptimal configuration can cause an higher response times even for SELECT queries. More about that. Postgres forks a new OS process for each new client's connection. These processes use lots of memory for work_mem, and that's why their number is hard-limited. Okmeter helps to easily understand, which IP addresses most of the connections originated from. Along with current states they are in. Also it's necessary to watch transaction duration within connections. Long lasting transactions may cause bloat and impact database performance altogether. More about that. Fault tolerance nowadays is a basic requirement for any database. Postgres built-in streaming replication is widely used to sync database across multiple servers. Okmeter will monitor all the critical replication parameters: WAL generation rate, replication lag in bytes and seconds. And will alert you if something's wrong. For a full coverage it's not enough to monitor only internal database metrics. Okmeter also shows you how many resources were consumed by every other process on the server. And any hardware resource degradation. Okmeter collects operation data on every subsystem and aspect of server functioning. This will provide you with everything needed to investigate any spike in CPU, disk and any other resource usage.